110v hammermill is an easy to use grinder that allows for at-home production of livestock feed. Includes grinder, bucket and 3 sieves (4, 6 and 8 mm). 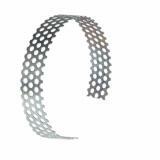 Can also be used with the 1mm sieve (sold separately below) to produce a coarsely ground flour. For grinding corn and other grains into more manageable sizes for livestock. Useful for producing small batches or mixing home blends of feed. Produces a coarsely ground flour for baking. 1.2 HP motor. 900 watts. Start-up draw 23.5 amps, working under load draw 9.47 amps. The bin for storing grain prior to grinding measures 17" x 19". 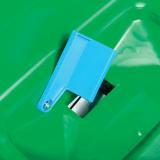 The lower portion of the bin where the grain sits before processing measures 10-1/2" x 9-1/2". The base is 16-1/4" off the ground. The opening where the processed grain drops out is 6-1/2" x 2-3/4". 110v allows it to be powered by any normal house outlet, no need for the installation of a 220v outlet. 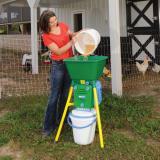 Save on the cost of the feed store mixing feed, make it at home the way your animals like it. Portable, only 30 lbs and can moved to where its needed when its needed. With the 1mm sieve (sold separately above) you can grind and mix your own flour. Replacement parts for the Bravo Grinder that have worn out or broken. 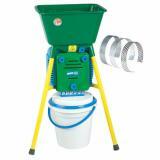 An inexpensive all-purpose bucket for feeding or watering lambs, goat kids or chickens. They stack without sticking and are easy to clean. 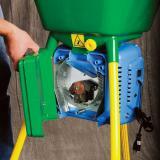 An inexpensive all-purpose chore bucket. Use to feed or water sheep, goats and chickens. 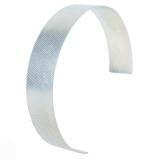 See the Data Tab above for a Replacement Parts Diagram. 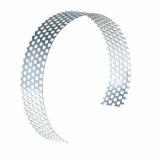 Number of reviews: 30 customers reviewed this product. Recommended: 30 out of 30 said they would recommend this product to a friend. Recommend the product and the provider. Works great! We grind whole kernel corn into flour. 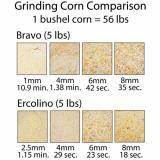 Depending on how dry the corn is it grinds a buschel in 4-6 hours. When starting grinder up you need to be careful that there is not too much corn in the bottom section else the thermal breaker will keep tripping until you open it up and clean it out. Works great. Purchased for my husband to use for corn grinding to feed the animals. No problems at all. Works surprisingly well given the primary colored plastic... looks like a kid’s toy! Easy to assemble. Love the spring-loaded bucket top that connects with the hopper and prevents dust. It is quiet and efficient. The motor is surprisingly strong and even at full open it does not bind up. Except for the 1MM sieve. Tring to do a corn flour and it keep clogging. Main complaint is that I need a sieve-size between 1MM and 4MM. 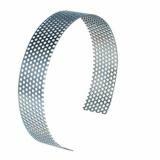 Just ordered some perforated stainless sheeting that is 2.4MM and will attempt to fabricate a customer sieve.